Just to reiterate, you can write tags using the @tag syntax literally anywhere in Pagico. And it’s really up to you as far as how to tag items. 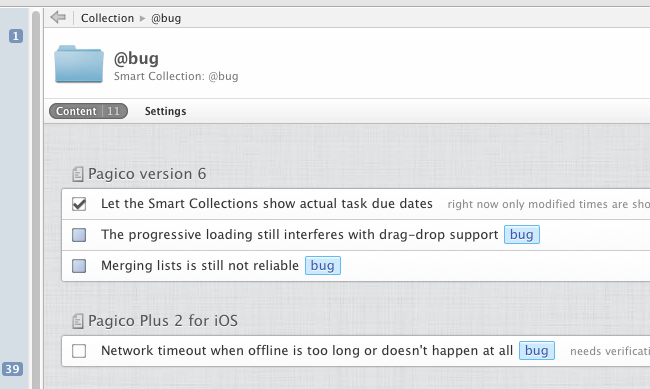 For instance, the screenshot above shows how we use tag @bug to mark software glitches. Once you have things properly tagged, proceed to step 2 to collect and track those tagged items. Simply click on the “+” button at the lower left corner, and choose the “New Collection” option. 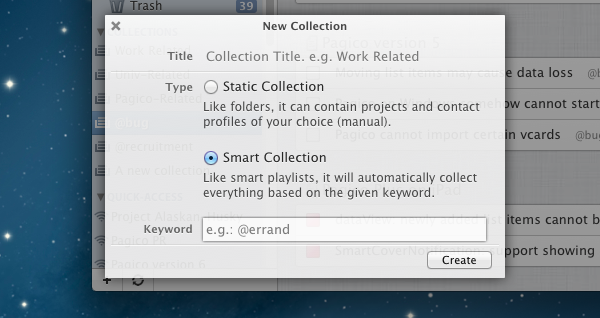 In the popup panel, give the collection a title, select the “Smart Collection” option, and write down the keyword (e.g. @office, with the @ symbol) that you want to track. It’s recommended that you title the collection the same as the tag you’re using (for instance, title it as @office as well). Want more (finer) control? Use multiple tags. When using multiple keywords, be sure to include the @ symbols, and use comma (,) to separate keywords. This gives you finer control over how items are collected based on keywords. This way, you can easily set up a smart collection for things tagged as @office + @legal, and another for things tagged as @office + @phone-call, etc.